What is Visionarus Digital Doorman? Visionarus Digital Doorman is a patent pending solution that allows existing apartment community intercom systems to authenticate and authorize visitors to enter the building using one-time dynamic passwords with voice recognition. The system provides dynamic access control, easy provisioning and revocation, logging, alerting and support for multiple users. All without the need to install any additional hardware. Visionarus does not require additional hardware installation. It works with your current intercom system. Visionarus works with any telephone entry system as long as it can make calls to cell phones. Visionarus uses a voice recognition, one-time password system to authenticate visitors. This technology is the same type of authentication that is used by banks and large corporations. Access is granted to each individual separately with remote authorization and revocation. Know the exact time each of your guests enter the building. Ring all phones in the house at the same time when someone calls on the intercom. Generate reports based on entry logs. 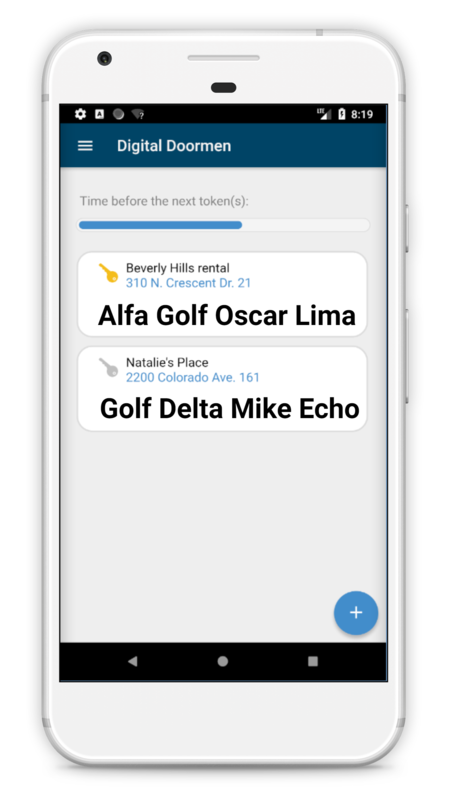 Receive a text message on your phone whenever one of your guests enter the property. Free with no obligation and no installation costs. The App will continue to generate dynamic passwords even if your smart device is offline for as long as the application is running. Hosts do not have to stop what they are doing to answer intercom calls. Hosts do not have to touch a phone to let regular guests in. Visionarus works with any telephone entry system as long as it can make calls to cell phones or supports SIP. The Visionarus app is available natively for Android and iOS. A web client can be used on Windows Phones, Blackberries, and any other device with a web browser. Do you have someone coming to take care of children, the elderly, or to perform cleaning services? Assign a dynamic password and uniquely identify and get alerts when the person comes in. Run your own Airbnb or have guests visiting? Visionarus can dynamically provide codes to your guests that can later be easily revoked. Ring all phones at once or have a directory for the apartment unit listing all tenants. Realtors can replace external lockboxes with our virtual key solution and receive notifications when specific prospects visit the unit. Say goodbye to building and amenity replacement key nightmares. Automate your garage entrance with Visionarus. Medical units with telephone entry systems can use Visionarus to create a hands-free environment for caregivers.